We propose a new method for input variable selection in nonlinear regression. The method is embedded into a kernel regression machine that can model general nonlinear functions, not being a priori limited to additive models. This is the first kernel-based variable selection method applicable to large datasets. It sidesteps the typical poor scaling properties of kernel methods by mapping the inputs into a relatively low-dimensional space of random features. The algorithm discovers the variables relevant for the regression task together with learning the prediction model through learning the appropriate nonlinear random feature maps. We demonstrate the outstanding performance of our method on a set of large-scale synthetic and real datasets. 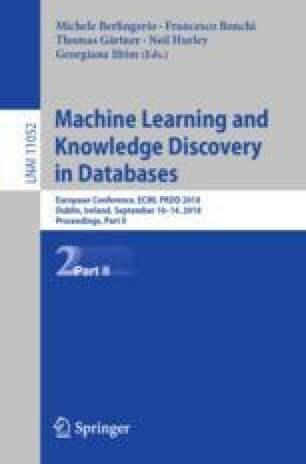 Code related to this paper is available at: https://bitbucket.org/dmmlgeneva/srff_pytorch. This work was partially supported by the research projects HSTS (ISNET) and RAWFIE #645220 (H2020). The computations were performed at University of Geneva on the Baobab and Whales clusters. We specifically wish to thank Yann Sagon, the Baobab administrator, for his excellent work and continuous support.